Gender Gap in Doctors' Starting Salaries; Who Earns More? What are your healthcare data needs? Email us at info@hin.com and let us know what topics you'd like to see covered in the Healthcare Data Digest. © 2011 Healthcare Data Digest by Healthcare Intelligence Network. 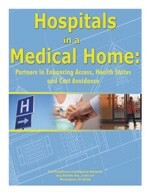 Hospitals in a Medical Home: Partners in Enhancing Access, Health Status and Cost Avoidance, a 25-page special report that discusses how hospitals can partner with medical homes to deliver patient-centered care to uninsured and low-income patients while reaping the financial benefits associated with decreased utilization and duplication of services. Click here to order your print copy or PDF Instant Download today.